The Lonsdale face-saver headguard features a padded crossbar that protects from direct hits to the face, while still allowing for a full range of vision. The headguard has large, padded ear holes that provide increased protection. The adjustable top and rear lace closures ensure a comfortable and secure fit. The outer shell is made from genuine leather and the interior is lined with a moisture wicking material that keeps the head dry and cool. 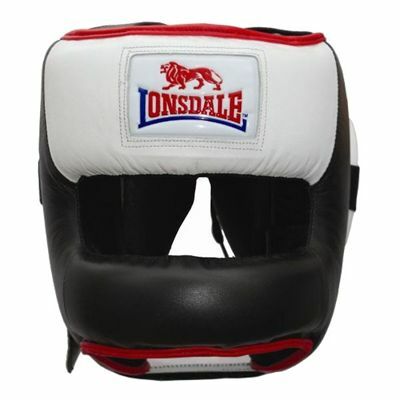 for submitting product review about Lonsdale Face-Saver Headguard.